Two people were slashed Sunday inside one of New York City’s busiest subway stations, police say. 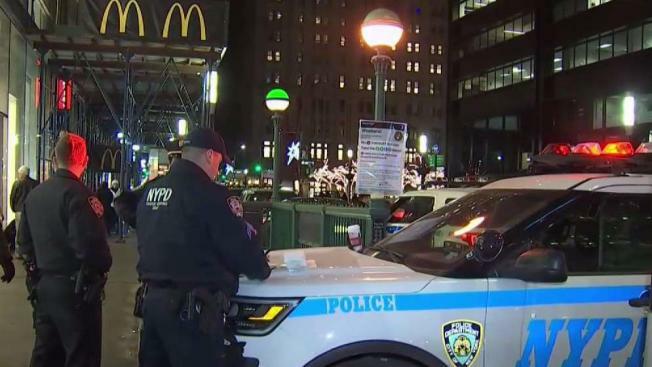 Officials say the Fulton Street stop in Lower Manhattan became a crime scene around 5 p.m. after two straphangers were slashed by a man after an argument turned violent. The NYPD said a 26-year-old man was cut on the left side of his face and then a 36-year-old man who tried to intervene was cut on the left side of neck. The two victims knew each other, according to police. One witness said she saw two victims bleeding and saw police rushing in from every direction trying to get to the scene. The two men who were injured are expected to be OK, according to police. Cops said the victims were not cooperating with authorities. The suspect quickly fled the area before police arrived on the scene. Police said the attacker is believed to be about 30 years old and was last seen wearing a black hat with a white skull on the back of it.